PITTSBURGH – Andrea Wetherald of &Beyond will present two CEU credit classes, “Improvising Leadership: Natural Connection Without the Theatrics” and “Fun Over Friction: Improv for Effective and Impactful Teamwork,” at the 2019 Pittsburgh Business Show, the largest business for business networking and tradeshow event being held at the David L. Lawrence Center on May 14 and 15. &Beyond, founded by Wetherald, is a Pittsburgh-based applied-improv leadership development consulting and coaching firm that uses improv as a training and content delivery method to assist companies who are passionate about the employee experience and are experiencing growth-related transition. Wetherald said the “Improvising Leadership: Natural Connection Without the Theatrics” workshop is geared toward leaders of companies who are experiencing rapid growth but don’t want to grow away from the amazing culture they have established. “That training is much more geared toward leadership and culture that does not leave good people behind.” This workshop provides practical insights that can be implemented to help leaders foster deeper connections with their team. With Wetherald’s improv-based leadership development programming, companies can take their collaboration, communication, and group dynamic to greater heights and learn skills to get more out of their teamwork and other collaborative experiences. “We use improv skills to help people think creatively to use the tools and skills they already have and help them to learn new applications for that,” Wetherald said. These skills, Wetherald said, are skills that you can use for the rest of your professional story for effective communication. The “Fun Over Friction: Improv for Effective and Impactful Teamwork” class is geared toward HR professionals who have a stake in the corporate culture and have a work capacity that focuses on areas such as employee engagement or employee retention. For those who are apprehensive about improv, Wetherald said that improv is not about putting people on the spot. “I want people to know that improv is surprisingly approachable. It’s very common for people to they are so freaked out, or they can’t imagine their group doing this.” Wetherald said there is no performance component with improv and that everyone participates in the games together. 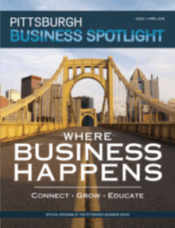 The Pittsburgh Business Show currently has over 30 speakers and four workshops to attend over the two-day event. The event also includes speed networking and the 2nd Annual Business Choice Awards. Purchase your tickets for the event at www.PittsburghBusinessShow.com.